Today I decided to take another tour from Bergamo, though it would have been better to take the train on weekdays as the schedule of trains is more frequent then. 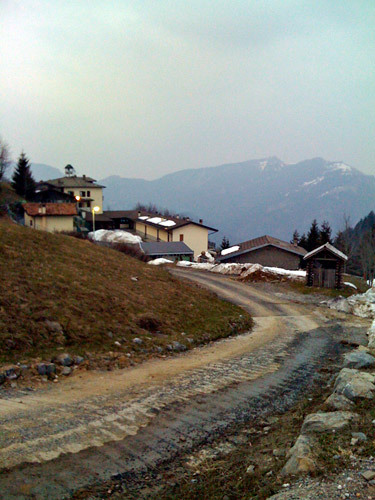 As usual it was the same cobblestone road out of Città Alta and then the road up the Valle Seriana. Last time I would travel on this road which I had become quite familiar with now. I was going to turn off the road at the first place where one could go up in the mountains outside Bergamo in this direction. After Bergamo it is only like 3 km before you reach the turn off for Nese and Monte di Nese. The climb to Monte di Nese is of course popular with local cyclists and I saw several cyclists here. The climb is not very long, but long enough to be a real mountain climb. The climb is 10 km long and has sections near 10%. 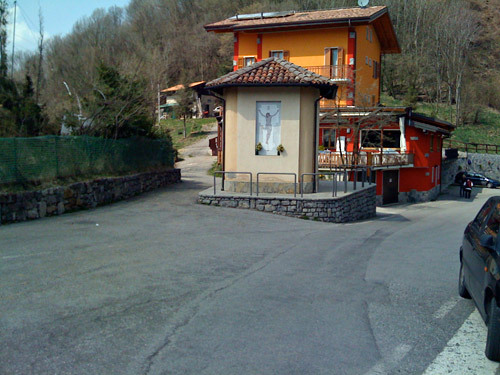 Forcella di Monte di Nese (880m) is located above where the asphalt roads end. I took the more direct road to it when reaching the top as I thought it might be good even if steep (I had noticed two approaches on the Kompass map). It is quite clear where to turn off and here is a 26% concrete paved ramp which is quite hard, but unfortunately this only leads to a house and then I had to walk up with the bicycle on the steep path for 200-300m to reach the pass. I had seen a photo of the pass itself and it looked cyclable at the pass and indeed it is, but not the path up there that I took. I walked up a bit on the concrete road that looks difficult here to get a better view for the two photos I took here. A mountainbike guy was coming up from the other side (which may be impossible with a road bike) and he looked very tired! There are nice views at the pass. I took the alternative road back and this was a pretty bad gravel road which was just about cyclable with my bicycle, but on the other hand you reach asphalt in less than 500m (I think). The descent down from Monte di Nese is nice! Then another kilometres of cycling up Valle Seriana for the next and perhaps the most popular climb in the area around Bergamo up to Selvino. 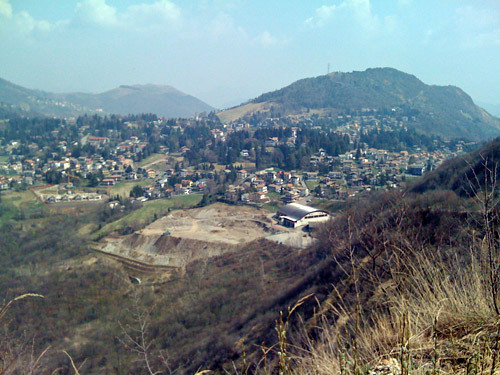 The climb starts in Nembro (309m) and has a moderate gradient at around 6% for 11 km. I had wanted to fill up with fresh water or buy a coke before starting the climb, but did not find any obvious place for this, so started out slowly up the serpentine road. I was only 100-200m up the road before a local cycling club overtook me in good speed and looking like they had seen a real amateur cyclotourist. Of course that woke me up and even though the first guy went away quickly up the road and disappeared, the rest of the gang was not going at full speed and I decided to speed up and hang on to them for a while to see what would happen. After a while going at a decent speed of around 14-15 km/h they noticed I was still there. We went on yet 1-2 more kilometres before they decided to have some fun and raised the speed suddenly to 24-25 km/h instead (which is like “competition speed” up there). It took me some seconds to react, but I was determined not to let them go quite yet and cycled up to them and now it was one of their guys who could not follow. After a while they slowed down again and now we was on talking terms ;-). They did not know much english though, but we talked of some Swedish cyclists and so. A little later one the guys decided to really test me (and/or the others) and went away again in at least as high speed as in the previous acceleration. I tried to follow at first (though no one else did), but decided I would have had to go at my maximum to be able to hang on to him and I was just at the start of my long day, so it was not tempting enough. Since I had started to follow him though, I decided to make sure the others would not caught up with me again and in this I succeeded. I turned toward Aviatico at the top, not realising (seeing) that the normal goal was to go right into the centre of Selvino, so I never saw the guys again. Anyway I was going to follow my original plan and that involved going down the other side to Algua in order to climb back up again via two other passes. 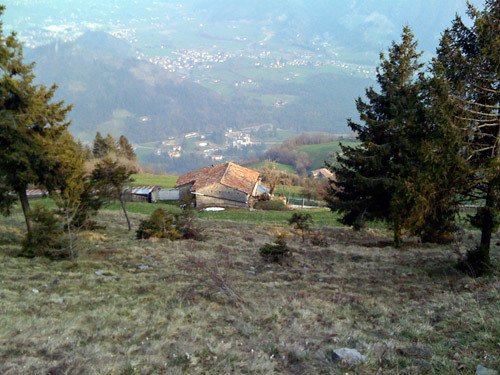 According to salite.ch the turn-off down here is at 572m (see: profile). The climb up via Sambusita (where I found good water) is steep and fun. When I reached the first pass (La Passata (964m)) I decided to stop for lunch at the Osteria there. It was a colourful house that served good food. 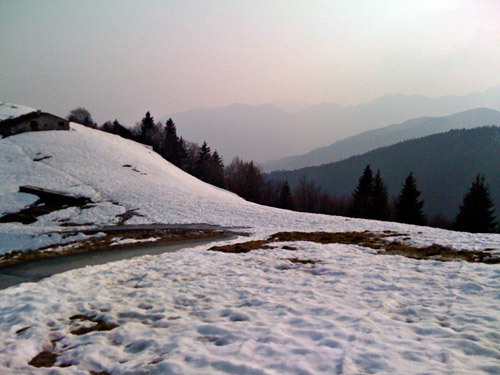 From here a lonely small, but asphalted, road goes up to Valico di Salmezza/Salmeggia (1106m). From above the small village of Salmezza, you have really fine views over Selvino, Aviatico and valleys in several directions. The descent to Selvino is short and slightly steep. 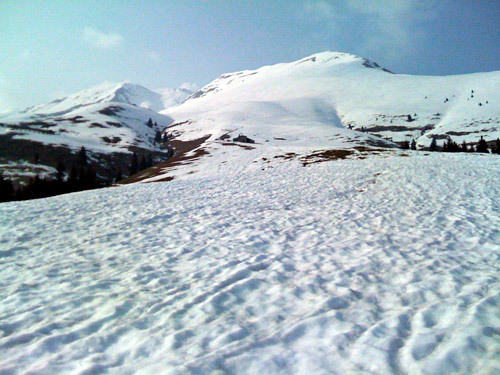 From Selvino I once again had to climb to reach Colle Botto (1026m) on the road to Ganda and the high point on the road up here. (There seem to be some concrete paved roads going up higher (one from Ganda was going to an observatory, but I am not sure it was cyclable and I did not try it).) Around Ganda it is the nicest on the road from Nembro via Selvino and Ganda to Gazzaniga higher up in Valle Seriana. At Ganda I turned in on the small road going to the tiny village and there took right again to follow a directional sign for Passate di Ganda (1045m). There are at least two places that could be referred to with this sign and I do not know for sure which it is. I went to the last possible pass, which is on a concrete private road and the views from there was the best of all! The descent from Ganda to Gazzaniga is quick on a fun road. Now, all this was really merely a warm up exercise for the main goal for the day. I was going to climb what I knew would be the hardest climb during this Easter trip. 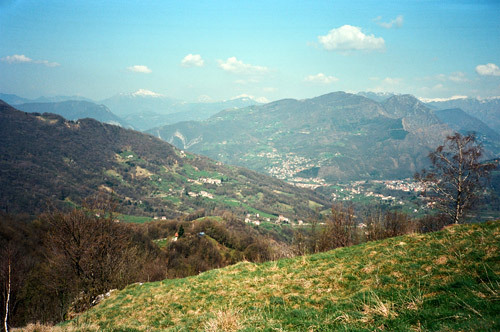 I was going up Valle Seriana further to Ponte Selva (476m) (which is just below Clusone) to climb Alpe Vaccaro. I had seen that this was the hardest climb in the area and in fact one of the hardest climbs in all of the Alps. Alpe Vaccaro is not so high at 1517m and it looked like it could be snow free from below (you actually can see more or less where this Alpe is located from below as you approach Ponte Selva). The first part up to Parre is not steeper than other mountain climbs (at around 8%) and I stopped there for a sandwich and coke. The problem is that this climb has an average inclination of 12% for 8.5 km, which is much steeper than the famous Mortirolo pass and seems to be similar to the Monte Zoncolan climb, that many regards as the hardest pass road in Italy (which is probably true). It continues steep up through the Parre village and the road to take is somewhat obvious (up to the church and then right and then up the wall). The climb out of Parre is on a straight and wide road with an average inclination of 18.5%. This is hard, but it is only a little “try before you buy” sample. This ends with a crossroad and map of the area. You should take right here on the private road (or you should not, if you are not insane). This road starts by descending – thanks a lot! Eh … . Descending means trouble! Now it continues like a nice little road with gentle inclination for some hundred metres before the real climb starts. Most of the climb here are on these last 5 km and here the average inclination is just under 20%. 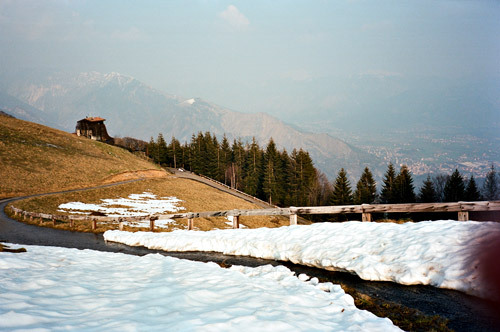 A climb for 5 km with a near constant 20% would be like climbing the Monte Zoncolan – hard but not impossible. However, the concrete narrow ramps up here (that are fixed with asphalt patches and with stones on the road) are often up to 26%. I would estimate that this section is to 75% above 18% and to 50% above 22%! There are only very brief paces to rest (almost flat or around 10%, which seems the same here). There are a choice of roads at least two times, but rule for which way to take is simple: you should take the road choice that you do not think you can cycle up! There are jeeps and farming vehicles on the road and it is a private road so you have to let them by and be careful about stones hurled up at you from their wheels! I have never exerted nearly as much effort on a bicycle as getting up this road before. It is hard to make real just how difficult this road might be to climb even for experienced cyclists who know that cycling can be very hard. I doubt that anyone has ever spent as much effort (relative to how good they are) in a bicycle race. It would have been at the finish of a bicycle race, but it is not likely to possible to exert that amount of effort no matter what kind of finish we are talking about. If they exerted that effort earlier in the race they would simply have had to stop and get off the bicycle soon afterwards (there is no way that they could have continued competing successfully afterwards). In training you could go harder than in races, but no one would go as hard as this as that would be counterproductive to the training. Put on Alberto Contador (or your favourite cyclist) a backpack with ca. 15 kg load (to make up for his better fitness) and 39-27, make him do it on a free day during the Giro d’Italia and go the same way I did before and after and I guess he is likely to agree with me about this climb. Cima l’Angliru, which has been climbed in the Vuelta, has been claimed to be one of the hardest climbs, but it only has one (albeit somewhat long) ramp with an inclination close to the many ramps here, but that is on a smoothly surfaced wide asphalt road. I think this climb is ca. 2-2.5 times as hard as the Angliru climb and Monte Zoncolan (I think they are about as hard as each other on the whole). It is like 4 times harder than the Mortirolo/Foppa climb. 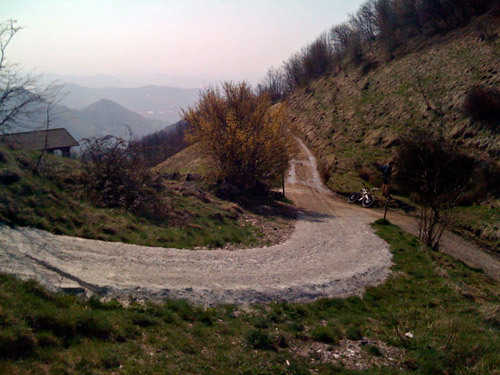 It is 2 times harder than Prato Maslino (recognised as one of the hardest climbs in Italy). It is ca. 1.5 times harder than the Viderjoch from Ichgl via Idalpe, which is the hardest climb I had previously done. Alpe d’Huez is only a little harder up than going down this road. You cannot really compare nice and easy climbs like Mont Ventoux to this as whether the Ventoux and similar climbs are hard is merely a matter of which speed you climb them at (and under what conditions). Sorry for rambling on here, but this is like I wrote in a forum, a climb that can destroy your bicycle, your body and your soul! I was nearly getting mad here, quite literally, and the pain associated with it could not be compared with a time trial ever. There were very few places in my body where I did not have severe pain (my neck was hurting more than ever in my life, my arms was should have been specially trained for this, my knees hurt so much I did not dare touching them, I had extreme pain in my feet, I had pain in my back and sides, I had pain in my wrists, I had such pain in my fingers after the descent that I find it hard to imagine a more sinister torture method than trying to bend them, my heart had to work harder than it had ever done at any moment in my life before, I think I had pain even in my face, I had some pain in my stomach. I was hard to stand up when I returned back in Bergamo later. It is these pains in combination with the effort that makes it inconceivable that anyone could have experienced something similar in a race. Still it was harder than you think. 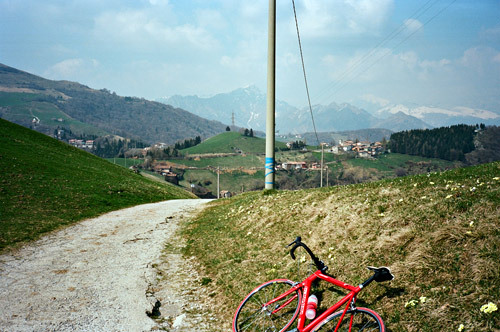 I think it is the hardest climb that could be done with a normal road bike and 39-27 transmission as the easiest gear. (At least with a backpack and my weight.) This is not to brag, merely to warn you and let you know what you are into if you would like to test your own limits. Also simply to describe what I was up to. I do not want to experience this again, I can tell you! I do not mind doing other very hard climbs, but please not this hard, thanks. I never reached the end of the road as it was covered with 1 metre of snow and had not been cleared. However, the last stretch was up was short and not very steep (perhaps 10% or so). I had to stop at a bar crossing the road at one point higher up. I noticed later that it was not locked. I tried to start on the other side but failed two times as the road is very narrow and it was like 22-23% directly after the bar. I had to walk where it got under 20% at the next turn. I had to sit down when it was no more than 18% to rest! I met a man and small kid walking up a bit after the bar where it was not as steep and upon reflection he said for himself “madre”, which was appropriate. I managed to tackle the last little opening in the snow to reach the high plateau from where I took some photos. The road is asphalted up here and quite good as it is apparent that it was recently asphalted. 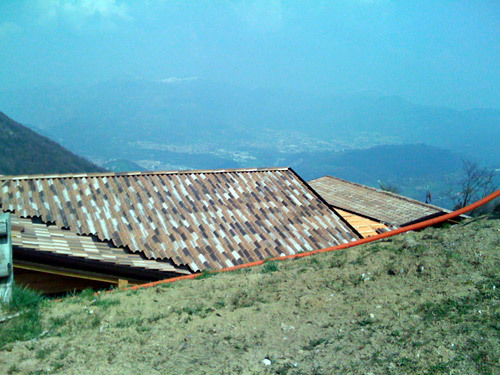 I do not know if it was asphalted all the way to the last house (the rifugio at Alpe Vaccaro), but probably. The account at salite.ch does not seem to be entirely correct and I do not know how old that report is. I have carefully looked at satellite photos from viamichelin.com and maps.google.com but they are actually not very helpful here and they are also obviously very old! The later part of the road I was climbing is only a poor path in those photos and the place where I had to stop has no sign of even a path in the satellite photos, so things have changed here. All this effort was not a totally pointless exercise in pain, I also gained some great views from up here and it is truly a very nice place with hilarious views (as one would have expected from looking up from below Ponte Selva). 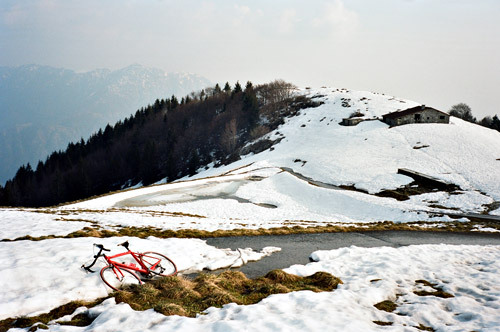 Going up with easier gears on a mountainbike or walking up here could be worthwhile! I had difficulty getting the insanity of this climb out of my head on the way down. It was very mixed emotions! Down at Ponte Selva, I did not go back to Bergamo – that would have been a sign of sanity, so God forbid! ;-) It was still sunny outside and I could still move and my bicycle was miraculously in one piece (even though it was “complaining” audibly at times). I decided to go up Colle di Vareno (1373m) as well. I had planned to do either that climb or another hard climb up to nearby Conca del Farno (1278m), but decided the later climb (with sections around 20%) would be impossible given the pain I had in my body now. Colle di Vareno (1373m) is on the way to Monte Pora (1453m, asphalt ends at 1550m), which is more known and has been the finish at Giro d’Italia. Monte Pora is another ski resort and thus the road is held open. I was satisfied to simply get to the pass on the way there though. It was cold and gloomy up there this late and I reached Colle di Vareno at 20 pm just as the twilight started. This pass is never steeper than around 10%, so it is possible to climb even when one is quite tired. The views are nice, but not exceptional and the place itself is a bit boring. It might be nicer beyond the Monte Pora village (maybe I go back there one day and explore it and there should be gravel roads continuing from there). I came back to Bergamo very tired of course, but managed to get something to eat. I cannot remember, but believe I went to the pub at the end of the Gombita road that I went to three times (I think). It was hard walking up the 5 stairs to the apartment (no elevator there)! I had problems washing clothes as I was so tired and I cannot remember if this was the night I went up around 3 am to wash my jersey and something else … .